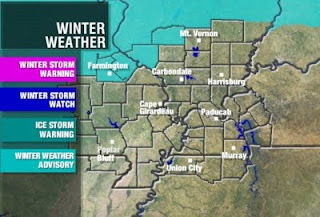 The National Weather Service in St. Louis has issued a Winter Weather Advisory for St. Francois and Ste. Genevieve counties in southeast Missouri and Randolph and Washington counties in southern Illinois. The Advisory is in effect until Friday night. In the advisory area 1"-3" of snow is possible. Right now it appears that most of southeast Missouri, southern Illinois, western Kentucky, northwest Tennessee, and northeast Arkansas will see rain this evening and Friday. There could be a little change over to snow on the back side of the system, but it won't amount to much. Further to the northeast Winter Storm Warnings are in effect for central Indiana and eastward in to Ohio. The thing to watch out for will be a little freezing rain on the leading edge of the precipitation. Ice should be limited to 0.10". john, what about sunday, monday, and tuesday. What do you think the cape area will get over those three days.